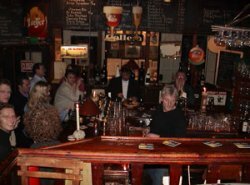 This Amsterdam pub guide provides tips and lists the best pubs in Amsterdam for you to try. The first thing you have to know is that the Dutch word for pub is 'café', and for the Dutch sums up everything ranging from rowdy joints for late-night drunkenness to posh designer places used by yuppies for business lunches. We've limited myself in this Amsterdam pub guide to places that come closest to what a Briton calls a pub: the Amsterdam brown cafes, beer cafes and 'proeverijen'. 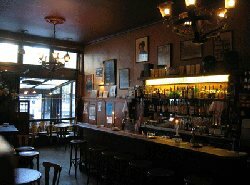 See our other page for other Amsterdam cafes or scroll down for some pub basics. Built in 1695 as house for the lockkeeper, this magnificent little black building is heavily leaning over. The terrace is one of the nicest in town, offering a great look over the Oude Schans and the Montelbaans Tower. It also serves snacks and salads. All in all, a top choice for any Amsterdam pub guide. 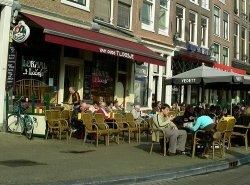 Dating back to 1670, this is one of the most popular cafes of the Spui square. Besides students, the cafe also draws yuppies. Next to beers, the cafe is also well supplied with jenever brands. Café Luxembourg, next door to Hoppe, is also recommended. This folksy Amsterdam café is one of those places where the locals will either look you away, or buy you a beer and start singing an Amsterdam schlager. An interesting place if you want to look into the psyche of the Amsterdam commoners. Every Thursday evening, there's live music. This 200 year old cafe, located at the border of the Red Light District, is a former tram house. It has an extensive choice of beers. Especially students visit this café. The small terrace at the front offers a great look over the Nieuwmarkt square, where there's a market every day. Though located in the deep south of Amsterdam, far from the tourist centers, this café nevertheless belongs in this Amsterdam pub guide since it's been receiving prices of the best Amsterdam café for many years. And this 'party café' (that's open from 6.30am (!) to far after midnight) is the place to see some typical folksy Amsterdam artists. One of Amsterdam's leading beer cafes that draws both many regular customers and beer enthusiasts from the Netherlands and abroad. It's also serves many brands of jenever. There's no music, making it a quiet place in a noisy part of town. Located in the Nine Streets area in the folksy Jordaan neighborhood, this cafe is a shabby place, but that's exactly its biggest charm. It draws a mixed crowd from journalists, students and other creative locals. It's Sunday morning breakfast is much valued by the locals. 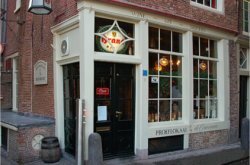 No Amsterdam pub guide would be complete without mentioning the 'proeverijen', also called 'proeflokalen' (literally: tasting houses). These are pubs run by, or associated to, distilleries. This practice dates from past centuries, when many breweries operated locally only. Often, they're terrific places with a lot of history and a wide choice in beverages. The biggest (and one of the most beautiful) of all Amsterdam tasting houses is connected to the Van Wees distillery. Besides some 16 jenevers and 60 liquors, all of their own making, it's also a restaurant. The oldest tasting house in Amsterdam (founded 1650) as connected then to the Bootz distilling company. Specializes in jenevers (Dutch gin) en sweet liquors. 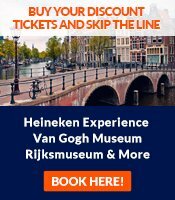 In it's long history, it's famous visitors included (according to legend) the famous painter Rembrandt, naval hero Michiel de Ruyter and world renowned philosopher Spinoza. A wonderful small tasting house, founded 1782, offering liquors from De Ooievaar distillery which is still located in the Amsterdam Jordaan neighborhood. The building is leaning over but it was actually constructed that way. Dating back to 1679, Wynand Fockink is famous for their house specialities, such as the 'Boswandeling' (a special mix of gin and liqueur) and it's 'Half en Half'. This place has very pleasant hosts, and is not expensive. Located right behind the Krasnapolsky Hotel. Know any other gems for this Amsterdam pub guide? Let us know. Lager beer ('pils' or 'bier') is the staple in Amsterdam pubs. A 'fluitje' is a small, thin glass while a 'vaasje' is a regular glass. Almost everywhere, beer is served with a 2-inch head of froth. Asking 'no head' will often be useless. Most Amsterdam pubs only serve one or a few brands of beer. Typically, this will be Heineken, Grolsch, Amstel, Bavaria or Dommelsch, with a 'witbier' (white beer; a turbid, crisp beer made with coriander and citrus) and/or another Belgian beer thrown in (the Belgians have much more specialty beers than the Dutch). 'Bokbier' is dark and sweet, and is served only in the autumn. If you want to have a large choice, or drink specialty beers, you'll have to go to the beer cafes listed in this Amsterdam pub guide. For the Dutch, a favorite liquor is 'jenever' (Dutch gin). There's 'jonge jenever' (young gin), which tastes smoothly, and 'oude jenever', which has a stronger taste. Some Dutchmen drink it with a small spoon of sugar. Another typical Dutch drink is 'Beerenburg', a strong-tasting herbal schnapps. Hours of opening differ - some pubs serve breakfast and open at 9 or 10am while others open at noon or even the course of the afternoon - but most are open until 12pm - 1am, and up to 3am during the weekend. The recent smoking ban for pubs, cafes, bars, clubs etc. means that you can only smoke in designated smoking rooms where staff is not allowed in. Smaller pubs don't have them, so you have to step outside then. It does tend to create a kind of bond between smokers, though.